In an article for the Sunday Express (not online) the Conservative leader sets out some themes of the 'Forces Family Manifesto' that he has invited Shadow Defence Minister Mark Harper MP to write. Better medical care for wounded soldiers and for those injured soldiers to be able to convalesce with their comrades. More modern accommodation for servicemen's families. Action to ensure that service families on NHS or dental waiting lists do not suffer from being posted to a new location. 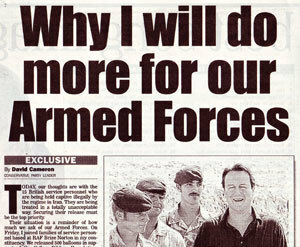 The article doesn't promise the extra public spending that might be necessary for progress but Cameron criticises Labour's expensive refurbishment of the Ministry of Defence, writing that the money "would be better spent on our forces." Liam Fox has also suggested ways of using existing budgets more effectively. Dr Fox has, for example, talked of a new model of procurement - based on that adopted by Canada's Conservatives - with more purchase of off-the-shelf equipment and less emphasis on commissioning bespoke weaponry and vehicles. The Tories also believe that NATO countries that are not fighting in warzones should make a financial contribution to those who do. The current NATO system means that nations that shoulder the physical work of peacekeeping or peacemaking also bear all of the associated financial costs. "Since I became leader of the Conservative Party the event that has had the greatest impact on me was visiting our troops in Iraq and Afghanistan. Some were only 18 and had been in the forces for only six months. In Helmand province I met troops who had been fighting the Taliban day in, day out, for weeks - living off ration packs, sleeping rough. Talking to them was an inspiring, humbling experience. Quite simply, our forces are the best. And they and their families deserve the best." "Impactful"?! Please! Tell me that's his word and not yours, Tim! Seriously, though - this is a tricky issue for us. Conservatism has always traditionally been associated with strong defence, a notion that's particularly striking during this anniversary period for the Falklands War. But in light of recent events in Iraq, and our attempts to soften our image, defence and the armed forces are not an issue to sound too harsh on. This is being dealt with very well - a focus on the more "human" problems our forces face is both well overdue and politically savvy. This is all meaningless waffle unless Cameron is willing to spend more of the nation's money on defence, for example, and stop spending it on waste in the NHS. Sorry BorisforPM - "Impactful" was my word! I agree with Umbrella Man: underfunding of the armed forces is one of the factors that has led us to this situation with Iran now. Tony Blair can't take it into a "new phase", because he hasn't got the means to do anything about it anymore. Britain needs to inject a large dose of cash into our armed forces, at the very least to give them back some self-respect. Umbrella Man - I was surprised recently to work out that the UK spends more per serviceman on defence than the US or indeed most other nations. As our servicement end up less well equipped, with often inferior weaponry that indicates that the expenditure is being wasted or ill spent. Some of it is probably in a bloated MOD, which seems sized as if we stll had the armed services of half a century ago.Then there are the 'grand projects'' for example the Typhoon at a cost of £19bn for 200 or so aircraft (over £800 million for each plane). Compare that to the X25 Lighting being developed with the US (UK pays 10%) at much lower cost to the UK, though BAE involvement is less. MOD often seems (and probably is, driven by political reasons) to be more of a commissioning agency for UK defence industry than concerned about the armed services. We need to review defence in terms of the roles which we forecast for our armed services and invest in those; though we shouldn't make the errors of 25 years ago and forget that we still need capability to mount expeditionary task forces, the US ghas shown that aircraft carriers make formidable bases from which to support land actions. The Trident Fleet are a relatively economic defence in terms of ultimate defence. It means hard decisions when faced with decisions that would mean buying US or European rather than BAE and UK but it is the equipment and support available to the front line that matters. While it is quite correct for DC to suggest that our troops go into war with the right equipment, it would be also nice if they could in future be directed towards the right sort of war. Judging by the comments posted on CH I am beginning to believe, with a heavy heart, that I the only Tory to think that we should leave Iraq and Afghanistan tomorrow on the basis that we have no right to be in either place and both countries would be better left to their own devices. What is going to be achieved by us being there except the death of more British servicemen? .....and utterly puerile, Mr Cooper. I seem to remember Hostages in Iran almost 3 decades ago. A weak leader, out of his depth and unable to command the country or his party let alone its overstretched army, was subjected to an 'ordeal by television' which he was powerless to resolve. As I recall, the public backlash led to the election of a new leader who pushed through the economic and military reforms that made his country the most powerful in the world. Maybe the same thing will happen here. Lets hope not - I'd prefer to see the 15 hostages back ASAP to a long drawn out bit of Iranian theatrics. Then we can find out why they were put in such danger to start with. Didnt Cameron previously say that meeting recovering drug addicts was the most impactful experience he had had?